Cultural historian Nathan Marsak is author of the book “Los Angeles Neon” and a tireless protector of endangered vernacular architecture and signage. He is active in the Los Angeles Conservancy’s Modern Committee, and has been known to bring extremely large, guano-encrusted neon signs home with him if it looks like they will otherwise be destroyed. He is currently working on a book about America’s historic funeral homes. 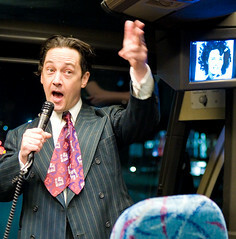 With Save The 76 Ball co-hort Kim Cooper, he hosts historic bus tours on the 1947project Crime Bus, including tours like The Real Black Dahlia and Pasadena Confidential. Photo credit Meeno Peluce and Adam.